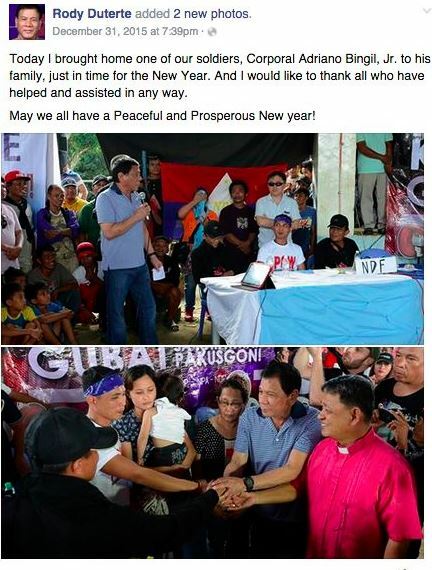 Duterte: Today I brought home one of our soldiers this New Year. A tough-talking Philippine presidential candidate Rody Duterte, known as “The Punisher”, promises peace and order within 3 to 6 months if he will won the presidential election this year 2016. As part of his promise in his speech to the residents in Barangay Durian, Las Nieves, Agusan del Sur in Mindanao Islands, following the release of Corporal Adriano Bingil from abduction by New People’s Army. Despite from criticisms that Duterte coddles Communist Part of the Philippines – New Peoples Army, he still advocates for peace discussions in the region including New People’s Army, Moro Islamic Liberation Front and Moro National Liberation Front and other rebels in the country. Rody Duterte is also known for “Change is Coming” and Federalism in Philippines. Duterte is running for president in Philippines this 2016 election against his rivals Mar Roxas, Miriam Defensor- Santiago, Grace Poe and Jejomar Binay.